Friendly staff, really make you feel welcome and comfortable. They act like they care about the guests! The room is compact, Euro-style, comfy bed. All I need. This is a great hotel. 2nd time for me and my wife. Near all the great spots in Williamsburg in walking distance clean rooms and friendly staff The only thing i didn't enjoy is the internet. Slow and worthless they claimed that it being worked on but i never seen any improvment during our stay I will return! Room: Minimalist design. Clean, comfortable bed. No drawers for clothes, no shelf in bathroom for personal toiletries, little privacy in bathroom due to frosted glass door, great Italian restaurant/bar around the block, staff was 5 star, breakfast was fine. Excellent staff and friendly, accommodating manager. Rooms are very small but is a great location. Close to many bars and restaurants. Wonderful breakfasts. Fun and quirky hotel rooms with futuristic touches. Love that is wasn’t a boring, generic Holiday Inn type room. The room could have been a bigger, but overall, it was a great hotel and we would definitely stay there again. We skipped the continental breakfast in favor of champs vegan diner, but it looked better than adequate. Nice black out shades, also. One night stay near relative’s home in Brooklyn. Very convenient to subway and very good restaurants. Hotel is clean, convenient, very well maintained. Very quiet despite being adjacent the BQE. Blackout curtain if needed. Good heat/cool system. Clean modern bathroom with rain shower; good hot water. Free continental breakfast is very good. Not a cool or stylish hotel, but does its job of accommodating us in a great location, at a great price. Friendly staff; we had no complaints at all. Would definitely stay again, and recommend to others. Great staff, great location, modern room. The bed wad a little uncomfortable and wall very thin. Overall experience great will definitely stay there again! We had a bday party and decided to stay on town instead of drive back to LI, we lived the hotel and staff, only downfall was the heating system, the thermostat said 72F but it was cold and not matter what we try we couldn't change it, we didn't want to call front desk since under the covers was extremely warm and we only stayed for one night. Overall the stay was great and I would definitely coming back if I need to stay on Brooklyn again. Really pleasantly surprised. Reserved for great price and location, so was expecting subpar facilities. The hotel was great though. Really clean and well-appointed room. Super-friendly staff. Free parking. Hotel Le Jolie is clean, quiet and staff were very helpful. About 1.5 blocks from the Metropolitan subway stop and near restaurants and small grocery. Breakfast was a variety of bagels, breads and patties; yogurts, lcereals, coffe/tea, juices. One downside is location is right next to highway and our room overlooked it. Then again, surprisingly dark and quiet for sleeping! After trying several hotels, I found this gem. It is centrally located in Williamsburg and a stone's throw from Greenpoint. And it is *just* off the interstate. It is new, attractive, well-lit, reasonably priced, etc. In short, it is perfect. Went to a show at Brooklyn Bowl and was looking for a decently priced room near by. Couldn't be be beat. For the price and location it is perfect - the staff at the front desk was exceptionally helpful, the room was immaculate, breakfast was included, and you could walk to the subway/Brooklyn bridge/great restaurants - I will stay there again. note: if you are looking for fancy or are high maintenance, this probably isn't the place for you. Located in Williamsburg, Hotel Le Jolie is within a 15-minute drive of popular attractions such as Brooklyn Bridge Park and Barclays Center Brooklyn. This 52-room hotel has free breakfast along with conveniences like free in-room WiFi and free self parking. Free continental breakfast is served each morning from 7:30 AM to 10 AM. Guests can expect to find free WiFi and 50-inch an LED TV with cable channels. 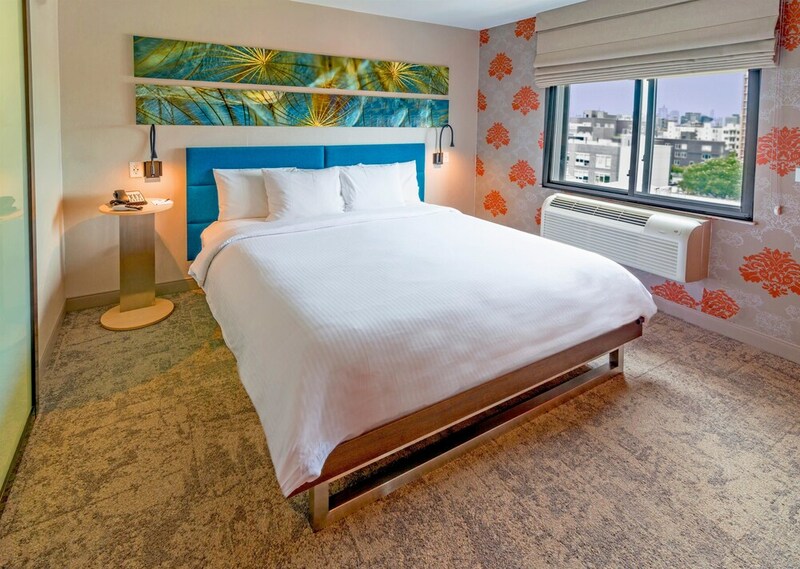 Tempur-Pedic beds sport Egyptian cotton sheets and down comforters, and the bathroom offers a rainfall showerhead, a hair dryer, and designer toiletries. Other standard amenities include free weekday newspapers, free local calls, and free bottled water. Guests of Hotel Le Jolie enjoy access to free WiFi in public areas, a 24-hour business center, and coffee in a common area. There's free parking and limo/town car service. Multilingual staff at the front desk are standing by 24/7 to help with securing valuables, tours or tickets, and luggage storage. Additional amenities include free newspapers and a TV in a common area. Thank you for the incredible rating. We are so glad we were able to provide you with such a wonderful experience and we hope to see you very soon! On behalf of our entire staff - It was our pleasure to provide you such a wonderful experience. We would love to see you back on your next trip to the area! Thank you for sharing this honest review and feedback about our staff and bed. Please do consider us again on your next visit to the area. We really appreciate you taking the time to rate your experience with us. Please come stay with us again on your next visit to the area. Thank you for taking the time to share your wonderful rating. We value your business and appreciate you choosing us. We hope to have the chance to serve you again on your next visit. Your comments are important to us as we continuously seek ways to improve upon the guest experience in our hotel. We thank you for the feedback regarding our staff and location. We hope to see you again in the future. Free continental breakfast is served daily from 7:30 AM to 10 AM.